Dave represents private and governmental clients in litigation, regulatory and administrative matters. Previously, he served as the General Counsel (2001-2013) and Interim CEO (2011-2012) at the Massachusetts Port Authority. While at Massport, Dave managed the successful defense of multi-billion dollar litigation stemming from the 9/11 attacks, and of nine lawsuits challenging a new Logan Airport runway. Dave represents clients in high-profile matters. Recent examples include the defense of the Massachusetts Gaming Commission in multiple lawsuits brought to challenge the Commission’s casino licensing decisions, the defense of the MBTA in a consumer class action seeking damages for storm-related disruptions in commuter rail service, a petition for judicial review against the TSA on behalf of airport trade associations and 24 airport clients, and representation of the Martha’s Vineyard Airport Commission in a sovereignty dispute with Dukes County over the Airport. 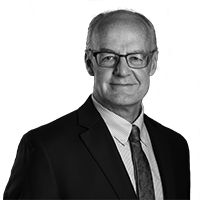 Dave also advises clients in governmental enforcement and regulatory matters, and has significant experience with internal investigations. He was recently appointed Special Master by a federal judge to review a guilty plea by two corporate defendants in a criminal Clean Air Act matter. Dave served as Chair of the Board of Bar Overseers from 2010 to 2013. He frequently represents clients in attorney disciplinary matters before the Board, and regularly lectures on legal ethics. He recently served as an expert witness on legal ethics in a federal False Claims Act case. Successfully defended the Massachusetts Gaming Commission against a challenge by the City of Boston to the Commission's award of a casino license to Wynn Resorts. Successfully defended the MBTA in a consumer class action regarding disruptions in commuter rail service during the historically bad winter of 2015. Successfully defended Massport in a lawsuit brought by a group of clamdiggers under the Oil Pollution Act, alleging that a jet fuel spill at Logan Airport damaged clam beds. Led a team of in-house and outside counsel in the 9/11 Commission investigation and related inquiries. Successfully managed the defense of multi-billion dollar lawsuits stemming from the terror attacks. As an Assistant U.S. Attorney, litigated several False Claims Act and qui tam (whistleblower) matters, and prosecuted one of the most significant post-Nuremberg Nazi war crimes cases. Massachusetts Airport Managers Association, "Airport Commissioner's Roundtable", September 2018. For the past 6 years (2013-2018) Dave has presented the annual legal ethics lecture at the Airports Council International (“ACI”) Spring Legal Committee meeting. In January 2017, Dave spoke to the National Association of State Aviation Officials (“NASAO”) about state and local regulations of drones. In September 2016, Dave and Mina Makarious delivered a presentation on state and local regulations of drones at the Massachusetts Municipal Lawyers Association Annual Meeting. In April 2016, Dave delivered a presentation at the U.S. Attorney’s Office in Boston on United States v. Aleksandras Lileikis, a war crimes case against a Nazi-collaborator whom Dave prosecuted as Assistant U.S. Attorney. In February 2016, Dave delivered a presentation on the attorney/client privilege to the in-house legal department of a large public sector entity. In November 2014, Dave lectured on legal ethics issues at the Society for Corporate Compliance and Ethics Conference in Boston. Dave spoke about the defense of a multi-million dollar lawsuit against an A&K airport client involving financing for a start-up airline, at the September 2014 Airports Council International (ACI) annual meeting. Dave presented a lecture on legal ethics for in-house lawyers to a large in-house legal department of an A&K client in February, 2014. Dave discussed “What General Counsel Want” at an MCLE New England panel presentation in October 2013. Dave spoke on Airport Access and Airport Revenue Diversion at the May 2013 ACI Legal Affairs conference. Dave presented the annual legal ethics lecture at the American Association of Port Authorities, Port Administration and Legal Issues Seminar, in April, 2013. Dave lives in Needham with his wife, daughters, his dog Baci, and his five fish tanks.